Billy looks like he is waiting for doo-wop partners to arrive. They arrive. 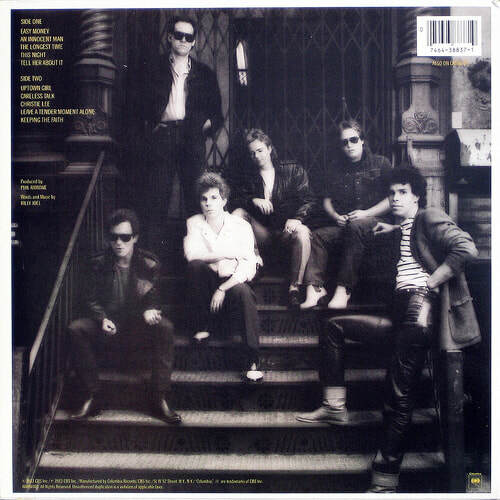 Billy Joel, Liberty Devitto (standing), Russell Javors, David Brown, Doug Stegmeyer, Marc Rivera (standing). After The Nylon Curtain and his divorce from his first wife, Billy took a vacation in the Caribbean where he met supermodel Christie Brinkley, Elle McPherson, and Whitney Houston at a chance encounter at a hotel piano lounge. Seriously (listen to Billy describe it on SiriusXM). Sometime thereafter, he and Christie started dating and Billy quickly returned to the recording studio in 1983 to record An Innocent Man. He was a man in love, and it shows in An Innocent Man. The songs are fun, ebullient, effervescent. He has said that the songs just came pouring out of him. He was inspired. The album was a labor of love, but not laborious. Billy was inspired not only by the new romance in his life, but also his lifelong love of rock and pop music. The songs draw from the various styles of music popular during the Fifties and Sixties. 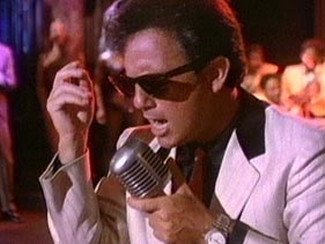 "Easy Money" is a James Brown or Wilson Pickett-like soul tune complete with beefy horns, "Tell Her About It" is a nod to Motown and The Supremes, "Uptown Girl" is a tribute to Frankie Valli and the Four Seasons, and "An Innocent Man" recalls Ben E. King's "Stand By Me." It all worked. Billy crafted a wonderful tribute to the music he grew up with and several songs became hits. If The Nylon Curtain was an homage to The Beatles of the late 1960s, then An Innocent Man is an homage to everything that came before that. The closing song "Keepin' The Faith" sums it all up: "I'm going to listen to my 45's, ain't it wonderful to be alive, when the rock and roll plays, when the memory stays, that's why I'm keeping the faith." 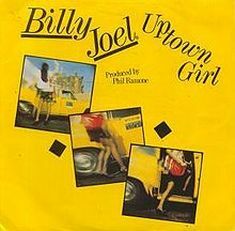 While the retro homage may not have been everyone's cup of tea, An Innocent Man showcased Billy's gift for melody and creating catchy pop riffs. He could have been a songwriter in the Brill Building during the late 50s and early 60s, like Carole King, churning out hit after hit. Fortunately, both Billy and Carole became singer-songwriters and performed their own songs. 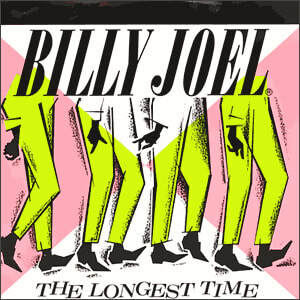 (Billy later covered a song that had been co-written by Carole King, "Hey Girl," in his Greatest Hits III in 1997). He would have been a successful songwriter and/or musician in any era. – From "Keeping The Faith"
​ The album cover was shot on 142 Mercer Street in the SoHo neighborhood of New York. It has since become a popular spot for Billy Joel fans to find and to take a selfie on the same steps that Billy sat on, in the same pose. 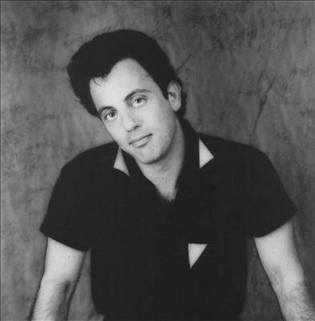 Billy Joel (1983). An Innocent Man publicity photo. Screen shot from "Tell Her About It" video. From 80sman.com. 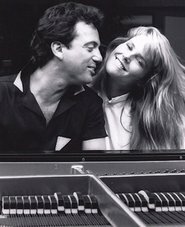 Christie Brinkley and Billy Joel in the video for "Uptown Girl." Various Interviews. 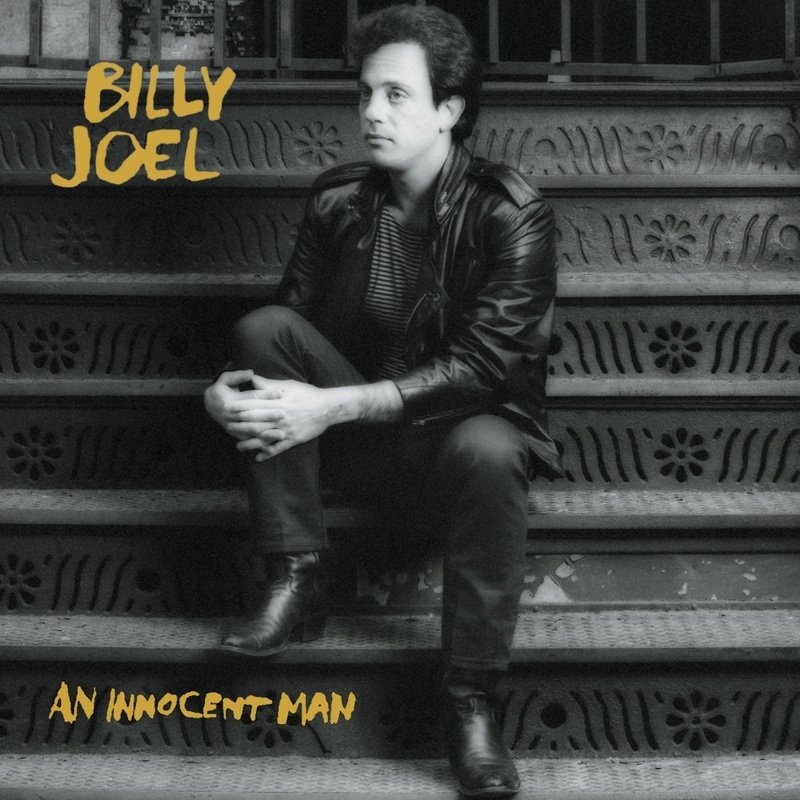 This playlist contains a series of video and audio recordings in which Billy discusses An Innocent man, or are interviews from the time when the album was released. Outtakes & Demos: This is a YouTube video (audio only) of outtakes and demos from An Innocent Man. 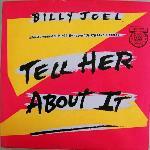 Thanks to BillyJoel CompletelyRetold for posting. Live in Wembley Arena (1984). This is another good televised concert, this time from the UK at Wembley Arena. 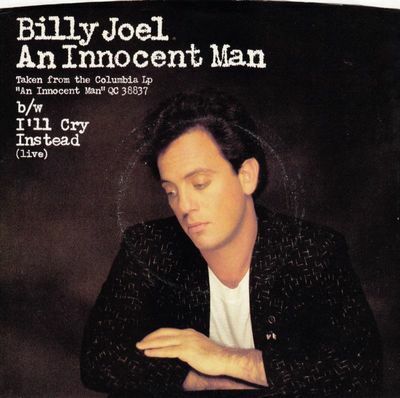 It was billed as Billy Joel: From The Piano Man to An Innocent Man, and was broadcast through much of Europe. The first clip is the entire concert, and then the later clips are individual songs. Billy and the band were in fine form. Live at MSG and Providence (1984). Playlist consisting of audio clips from two concerts. 1. 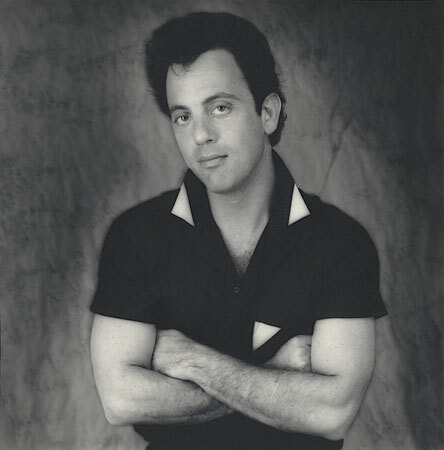 Madison Square Garden: Short playlist of songs from a Billy Joel concert at Madison Square Garden (MSG) in 1984; videos posted by Jennert. Features: Angry Young Man, An Innocent Man, The Longest Time (preceded by Teenagers in Love), Scenes from an Italian Restaurant, and Piano Man. 2. Providence: Two videos (audio with still photos) of concert in Providence, Rhode Island in 1984. Thanks to Reggie714 for posting. Ralph MacDonald – percussion on "Leave a Tender Moment Alone" and "Careless Talk"
Leon Pendarvis – Hammond B3 organ on "Easy Money"
Richard Tee – acoustic piano on "Tell Her About It"
Eric Gale – electric guitar on "Easy Money"
Ronnie Cuber – baritone saxophone on "Easy Money", "Careless Talk", "Tell Her About It" and "Keeping the Faith"
Jon Faddis – trumpet on "Easy Money"
David Sanborn – alto saxophone on "Easy Money"
Joe Shepley – trumpet on "Easy Money", "Careless Talk", "Tell Her About It" and "Keeping the Faith"
Michael Brecker – tenor saxophone on "Careless Talk", "Tell Her About It" and "Keeping the Faith"
John Gatchell – trumpet on "Careless Talk", "Tell Her About It" and "Keeping the Faith"
Toots Thielemans – harmonica on "Leave a Tender Moment Alone"
Mark Rivera – alto saxophone on "Keeping the Faith", "This Night" and "Christie Lee"